Ever wonder what a safari day looks like? Well it means different things to different people depending on their preferences-and the best outfitters will usually accommodate your wishes. Since we were on a private safari , we decided that we wanted the best opportunities to see and photograph wildlife in action. That meant catching the good light in the early morning and late afternoon hours when animals are more active (unless they are nocturnal by nature). So our schedule meant being ready to go at first light. That means a 5:45 am wake-up with a 6:30 am departure. Getting up that early is not really difficult in Africa. 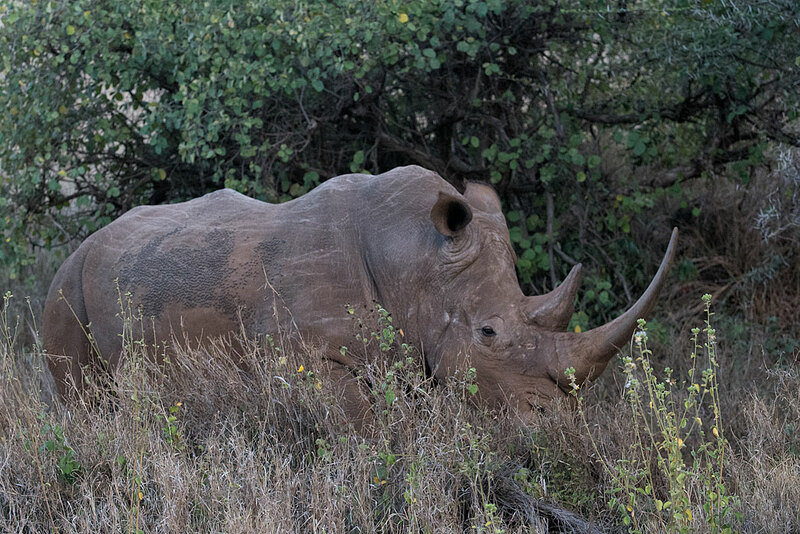 First the animals are already awake and it’s pretty standard at that time to hear a lion roaring, elephant trumpeting, hippo grunting or zebra braying . So might as well get up and get going! Of course it is a bit easier when the camp staff wakes you up at your desired time with coffee, hot tea & hot chocolate plus some cookies and granola. Secondly, when you think of the opportunities that await in the bush, the rush of adrenaline would not let you sleep anyway! Now getting an early start does mean cooler temperatures so we often bundled in blankets when we started out-but soon the day warmed so layered clothing was the only way to go. On this particular day, we witnessed the sun and moon being in the sky at the same time. In fact, we photographed giraffes to the west that had the moon over their shoulder and giraffes to the east that had the sun over their shoulder. An unusual occurrence most places but a common occurrence near the equator. As we moved on from there, we set up to photograph some birds at the top of an acacia tree. 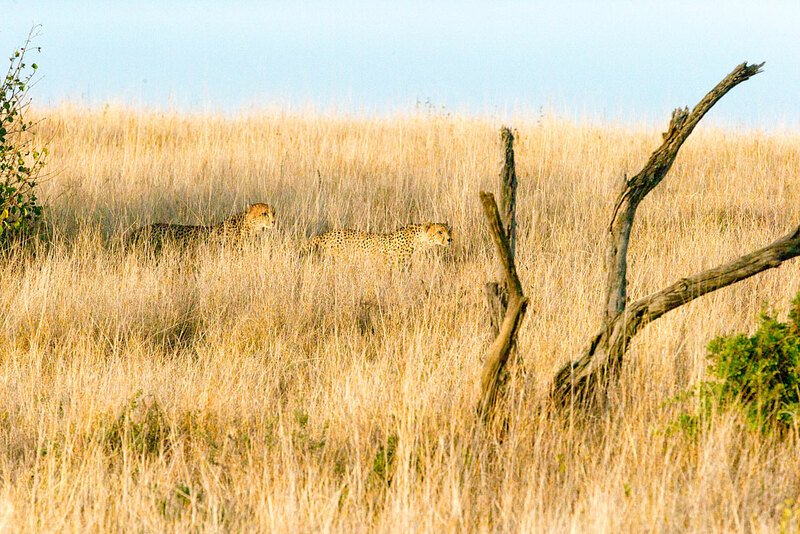 While we were doing so, Marian spotted two big cats climbing a hill. Well the birds could wait, because when a big cat shows itself, it always gets priority. In the early light, it was difficult to tell whether the two cats were lions, leopards or big cheetahs. 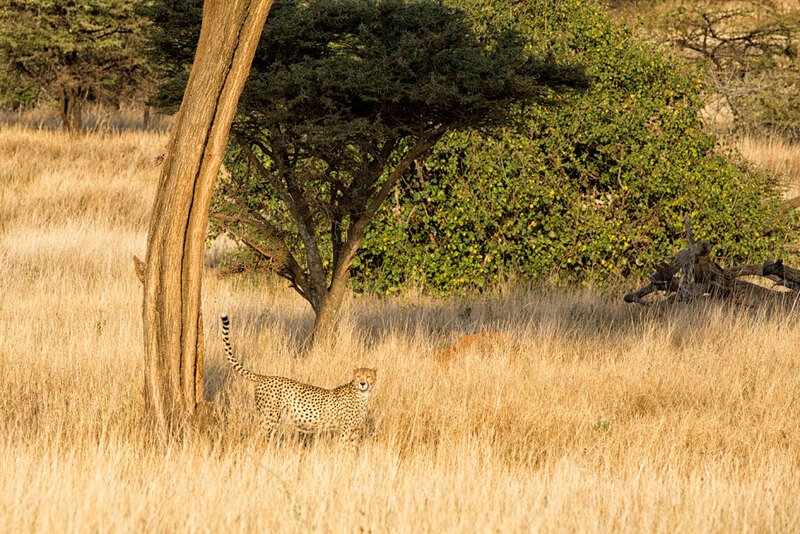 As we got closer, it was easy to see that the big cats were two big male cheetahs and they were on the prowl. How exciting a start and what a good spot by Marian! 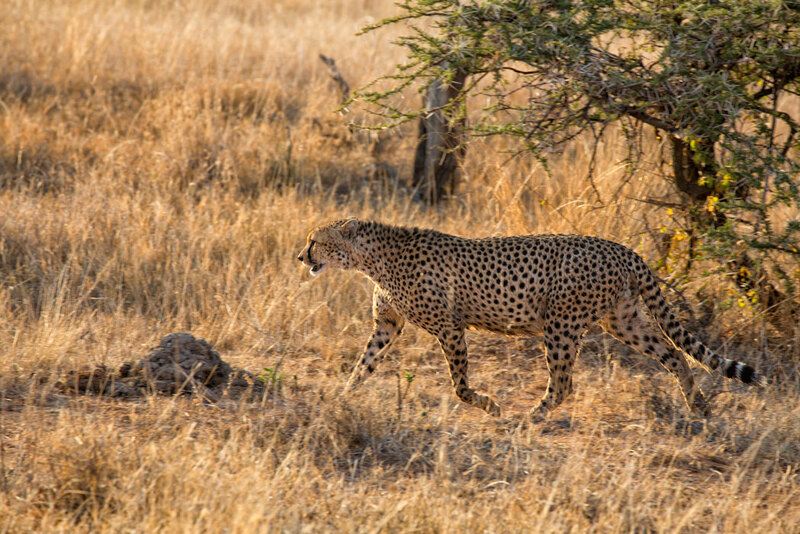 We followed and observed the two cheetahs for a while until we were cutoff by a rocky outcrop. During that time, we saw the two cats walk with a pace that reflected that they were on a mission. Apparently they were establishing the area as their territory as they proceeded to mark every tree, rock and etc in the matter that cats do. As we gave up tracking the cheetahs for now, we proceeded back to the camp for a hot breakfast. The Lewa conservancy is not so large that going back to the camp for a hot breakfast is impractical. We know that later stops on our journey will require traveling greater distances so bush breakfasts and lunches will become the order of the day. Until then, we will enjoy the eggs, meats and all the fresh fruit that is grown right there in Africa. It was amazing to us all the fresh fruit and vegetables that are readily available in East Africa. At 11 am, we head out again as the skies are partly cloudy which can free us from the poor light and harsh shadows associated with taking images at midday. It was not long before we sighted the first of many types of antelope for the day. 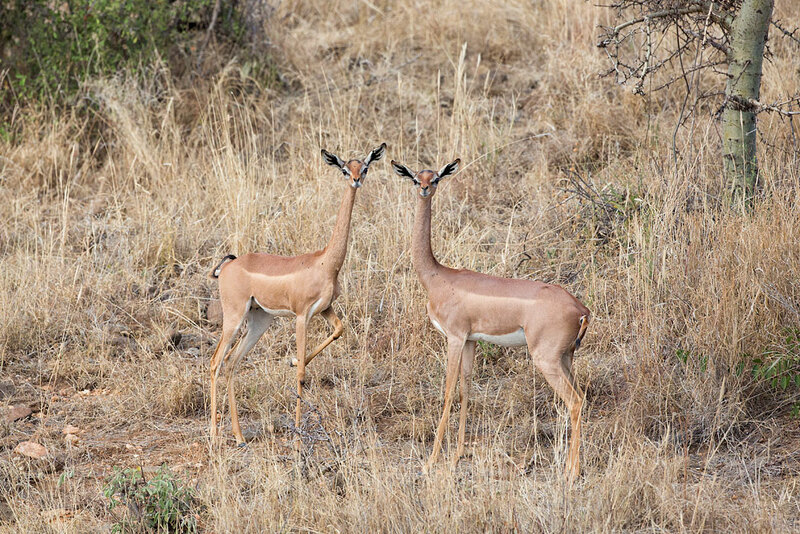 It was the odd antelope gerenuk which is referred to as the giraffe antelope. Upon seeing this somewhat odd creature, it is easy to see how it got that moniker. 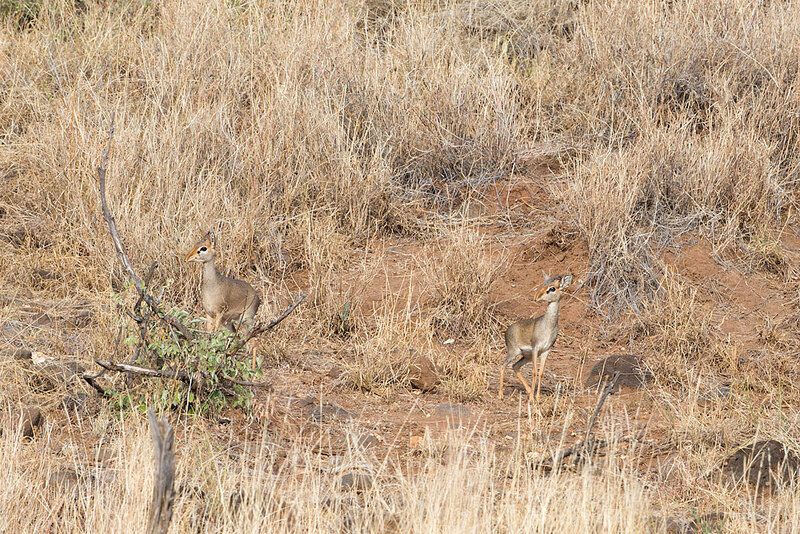 In short order afterwards, we saw the largest antelope-the eland and the smallest- the dik dik. Later on that day we would see klipspringers, oryx, impalas, and waterbucks. A wonderful day of sightings and photography and we had not even had lunch. Returning to the camp, we have another wonderful meal prepared by the Lewa House staff and then head to our rooms for some rest before our afternoon game drive. At 4 pm, we loaded the landcruiser again and head out to areas new to us. Joseph our outstanding guide who also happens to be a photographer has in mind heading to a small, lush valley bordering a small stream. The area was as he described it. Rich in vegetation, very green and a stark contrast from the dead grass that is so abundant during dry season at Lewa. Here the area seemed almost a sanctuary for the young and old alike. 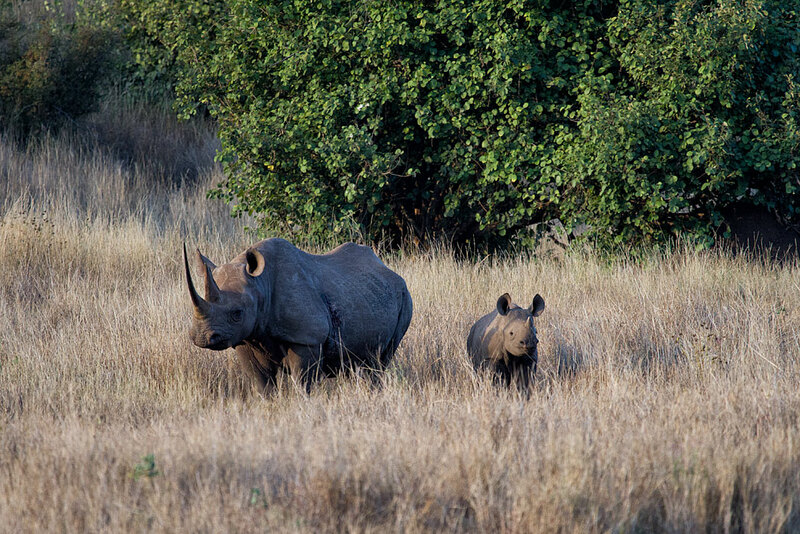 First we found a rhino with its young. 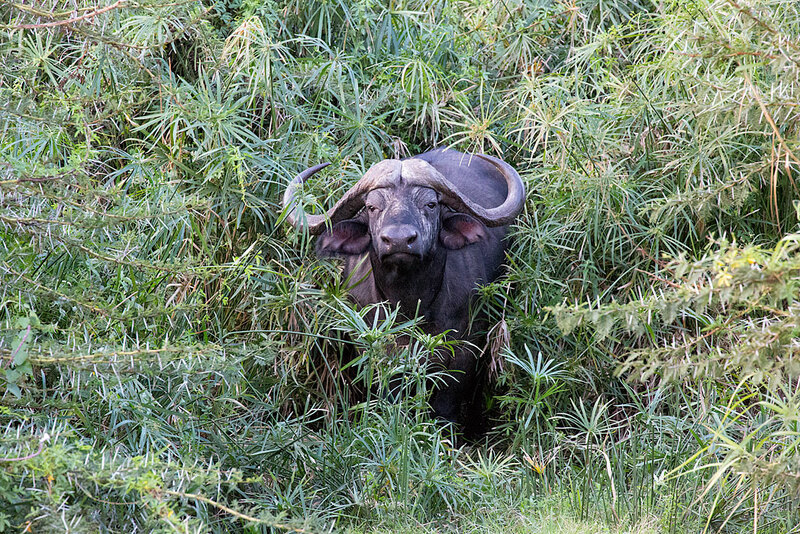 Later an old solitary cape buffalo that likely had been run out of its herd by a younger rival. And then just before dark, a mammoth male rhino who seemed to struggle to stand up. As darkness nears we turn to head down the rocky, bumpy and dusty road to the camp. As we drive, I cannot help but think about the “wonders of it all”. It has been an amazing day. And after a quick shower and a delicious meal, we will wander off to sleep dreaming both of today’s incredible adventures and the fact that we get to do it all over tomorrow. Fascinating stuff. I’ve heard neither of the giraffe antelope nor the dik dik antelope. I am can imagine how much you and Marian delighted in each moment. Hope Claudia and I can follow in your footsteps someday.